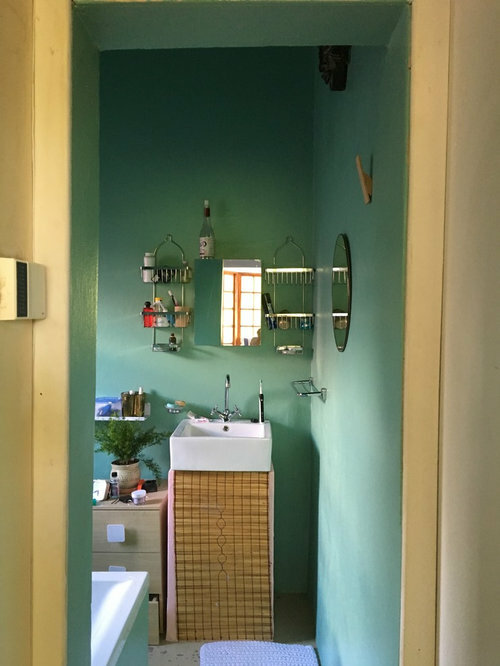 Bathroom redo went wrong! how do I fix it? We have a small, high-ceilinged bathroom off the master bedroom. It was previously all cement. 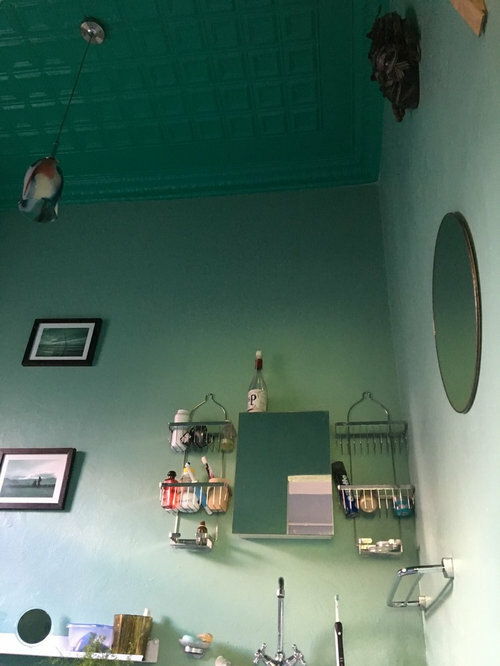 I thought I'd perk it up and give it a feeling of being in nature by painting the ceiling a dark jade color and the walls mossy green. But the colors showed up SO MUCH brighter on the walls than on my swatches (I painted A4s and held them up in the light)!! 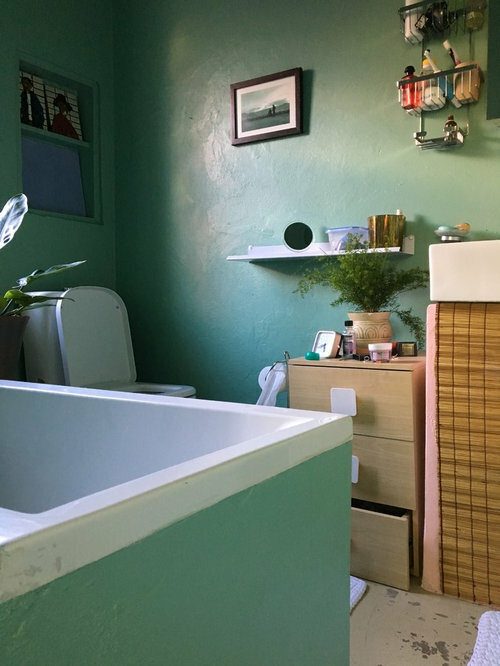 It's not at all restful on the eye, and I find myself avoiding it--which was the opposite of my goal, as this is the only bathroom we have with a tub. My boyfriend asked me, "Were you going for the feel of bathing inside a pint of Baskin-Robbins mint chocolate chip ice cream?" Is there any way to fix this without repainting everything? 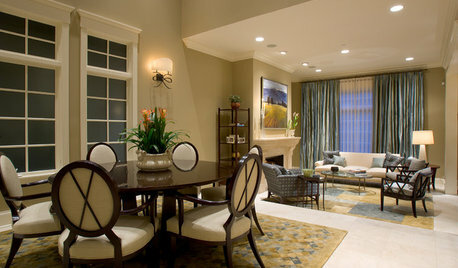 I was thinking of painting the wall facing the window silvery grey or even a pale brown. But what if I faux-painted over one or all walls to add texture? Or painted the walls a different color 1/3 of the way up? I do not have the capacity to add more lighting to this bathroom right now, unfortunately. 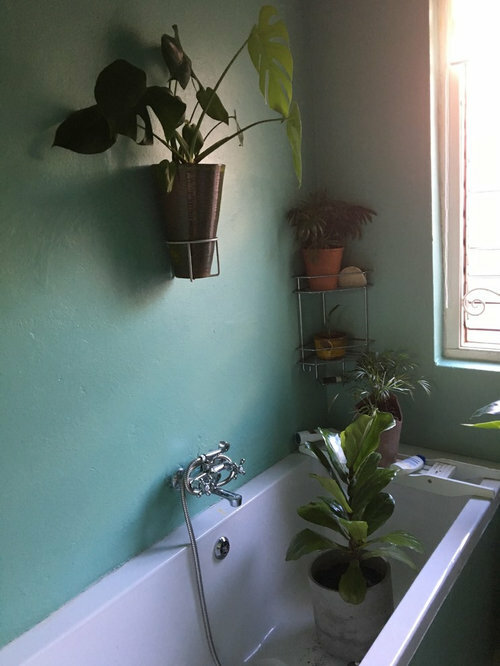 I really want to make this bathroom feel more restful! Paint is the only way to solve this dilemma. 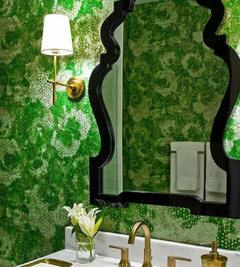 Please, never paint any bathroom or powder room any shade of green. Seriously? In different ways, these all look nice to me. Prime it all with two coats of white primer. It's okay to make mistakes. Just try again with a much lighter color, not green. Paint is the least expensive and quickest solution. Try a small pint of a new color before you go for the entire room. You fix paint with paint. Prime it thoroughly like suggested. If you want green go for a sage green or a blue green like sea salt. It's much calmer. If you are having this kind of reaction to it, I think the only solution is to prime and paint it a different color. You could try just painting one wall, but I think you will want to keep going. IMO, painting 1/3 of the wall will just make things look busier than they already are.....your eyes won't rest. 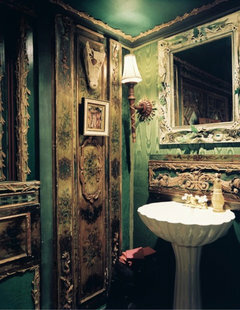 One of my favorite bathrooms was mint green and chocolate brown. Felt like an Andes Mint and I loved it - very calming to me. 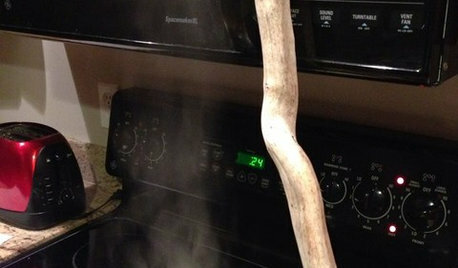 You might start by repainting the ceiling white or silver. ^ painting the ceiling would definitely help! Try that first and see if you are going in the right direction. I totally understand not wanting to paint everything over again! I agree with other posters--the only way to fix this is to re-paint the entire room, and the ceiling. 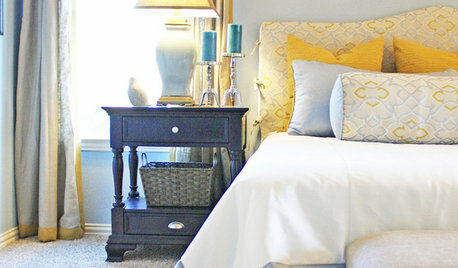 Another way to make the room more calm and restful would be to remove some of the "clutter". There is no restful place for your eyes to rest! I'd go for larger artwork, take down the wire storage shelves beside the mirror, and find one cabinet/chest to store necessities. A larger mirror is also in order. 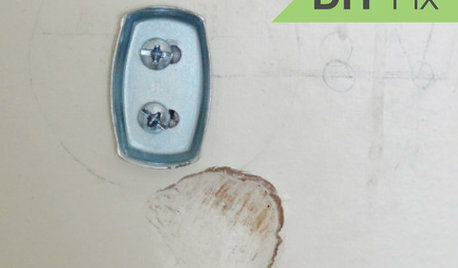 Maybe white beadboard on the bottom portion?? 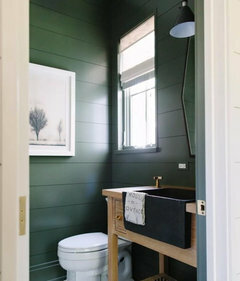 Regarding the paint, is there any green effect that those who do not hate green ipso facto think would work in this bathroom? Even as an accent? I love green but my partner really doesn't like it; our main tones in the house are RED RED RED and secondarily, blue. I mainly use this bathroom so I wanted a color I liked. There are already some nice plants in there that are hard to see. 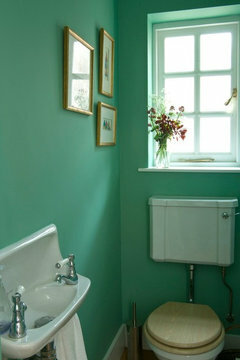 I love green (I’m considering BM Sea Salt for my master bath reno) but not monochromatic green. To me, either contrast or a complementary color is what makes color pop. So why not start with a white ceiling & a white tub surround....then reevaluate if you need to tone down the walls. I like green, just not that green. 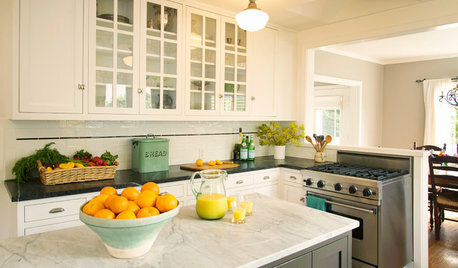 I agree with the above, repaint all in Sea Salt, it’s a great neutral and calming green/gray. I love green. I agree, the green you picked is not right. I like your first picture and the Benjamin Moor sea salt green is nice too. I dont mind the color so much, there is just way too much of it. A lighter shade like Palladian blue or sea salt or rainwashed would be a much better choice. 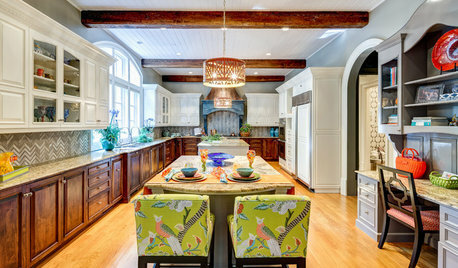 In any case, the ceiling needs to be primed and painted white. cat_ky, the impetus for the repaint was that there are major structural issues in the house that encourage mold and discoloration to white paint on the ceiling, especially since there's no ventilation other than the window and it's a very small room with a tub. In the long run those need to be addressed, but both my partner and I are in the arts (not visual art for me, if you can tell) and finishing big projects and we can't do that right now. I was hoping a darker ceiling color would be less susceptible to looking cruddy quickly. Thanks, Sammy! I can definitely imagine a white ceiling would entirely change the feel. I'm just a bit worried about the discoloration. I'm not liking the tub surround or the ceiling. White for those. And the stuff on the walls is a bit random. I do like all the plants. Don't they make some sort of paint that inhibits mold? Thanks, nice idea to do the tub surround white. I would paint the ceiling tiles copper.. It would change the feel of the room..
What looks wrong and how do I fix it? help! 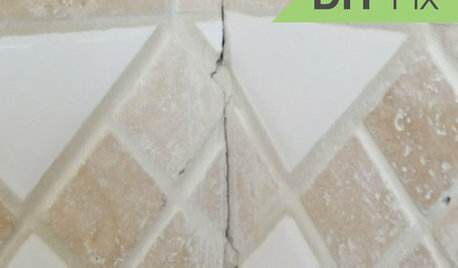 how do we fix this tile and glass mosaic problem? Do I fix bathroom after remodel? Help with placement!